The Path is an interactive 3D environment released in 2009 where sound and music are major elements to its perception as a work of sonic art. It is loosely based upon “Little Red Riding Hood”, in that its six protagonists are on their ways to “Grandma’s House”. Its visual programming environment, randomly generated character behavior and independent interactivity are technical elements that have helped to place it in an inter-disciplinary sphere of analysis too. 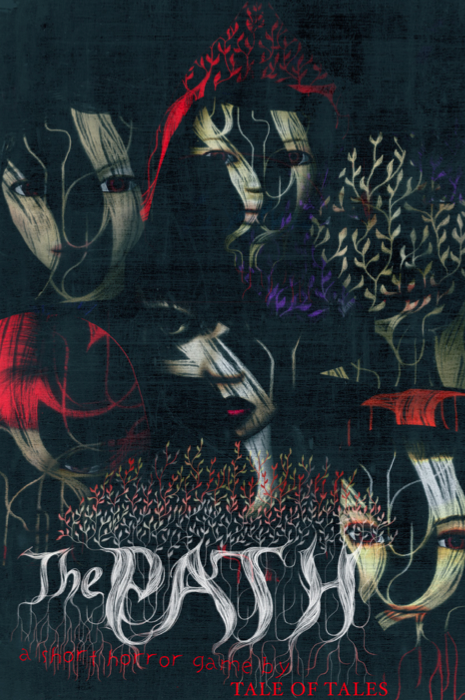 Clearly defined by its creators, Auriea Harvey and Michael Samyn from Tale of Tales, The Path isn’t a normal video game and has no clear objectives. It isn’t a competitive game, and a lot of its design considerations force the player to become an audience. Along with these aspects, the work’s aesthetics and cultural contexts are to be analysed using a post-modern framework, whereby the importance of re-contextualising allow independent elements of the work to be viewed separately and as functioning engines with the characteristics of sonic art. The fairytale theme of the game is one of its big aesthetic elements and has influenced its sound design as well as the character design. The important events in the game that can be analysed are the discovery of objects or “memories” as well as the darker themed “wolf encounters”. The opening sequence of the game immediately uses sound and vision, though they’re not necessarily tied. You emerge as one of the six protagonists from a distinctly 2D background of a city, accompanied by the rattle and clicks of a record player. What makes this an interesting aesthetic choice however, is the distinct cut off of these sounds as you immediately set foot into the forest. Harvey and Samyn state that “most of the story…relies on your active imagination…”(The Path PDF Manual 2009, p.3) and it’s this statement that elicits the idea of your character moving from a busy technological environment to a Lo-Fi one, and where complex structures of nondiegesis and extremely simple diegesis come into play. The “wolf encounters” also add to this complex nondiegesis. A “wolf encounter” describes a confronting situation catered individually to each protagonist, dealing with blossoming sexuality, introspection or fear, with Harvey and Samyn stating that “The Path offers and atmospheric experience of exploration, discovery and introspection through a unique form of gameplay, designed to immerse you into its dark themes…”(The Path PDF Manual 2009, p.3). The character Ruby, for example, is a late adolescent and her “wolf encounter” is with an older man who she meets in the forest. The scene shows her accepting a cigarette and it goes black, with the snarling of an animal, most likely a wolf. From there, your character awakes on the ground in the rain and must walk to “Grandma’s House”. The complexity shows here again in that the encounter occurs within a realistic setting, but the aesthetic of the sound design dissolves the distinction of having heard or not. The Path’s aesthetic consideration into its sound design are complex and have the ability to provoke the question of whether or not your avatar can hear what you can. The event based sounds and the expansive number of different sounds that are produced from character and player interactive decisions in this inter-disciplinary work can be perceived within the realm of arts and music and how they’re defined. As it’s multimodal, The Path expresses both of these and begins to aesthetically align in sonic art as a form defining itself. The cultural contexts of sonic art have placed an interesting inter-disciplinary status on video games and how they’re involved within its sphere. Where a lot of video games are considered a recreational past time, they’re also a lot of elements of them that cross over into sonic art’s disciplines. Wishart’s involvement with digital audio and software tools in computer music and his writings on it proposing the use of computers as instruments and Gibbs’ review on Luigi Russolo’s original proposal to the composer Francesco Pratella blend, letting us build on the notion that the computer can be used to compose environments and create event based sound works as mediums that are video games like The Path. There is a particular environment within The Path that exhibits a cross-cultural element. Wishart explains, “Whilst attending the IRCAM…computer music induction course in the summer of 1981, I had many of my ideas about the internal structure of sounds confirmed… and also discovered an instrument – the computer…” (Wishart, 1996, p.3), stating the computer as, a now evolved, medium for expression. It’s this notion that, when recontextualised, allows us to suggest that this tool creates an entire environment that is a composition. Once the player reaches “Grandma’s House”, the perspective becomes 1st person instead of third. Inside, all the objects you’ve picked up and their sounds are brought into the foreground of your sonic environment. It doesn’t matter what direction you press, your character goes through pre-destined rooms, where the memories become themes, their individual sounds fading in and out, becoming an interesting series of organized, but previously chosen, sonic events. Wishart mentions some methods too, that are used with computers as instruments“…techniques such as frequency modulation synthesis, cross-synthesis and model building…” (Wishart 1996, p.3), which are evident in their sounds that only appear in the house, particularly the frequency of a high-hat, and a randomized envelope on the snarling sound that gets louder if you stand still. Gibbs’ review of the futurist arts Luigi Russolo’s proposition of what sounds could be to music, as an extension, helps to further the blending gradient of these cultures, whether they’re noises from the street or warfare. “Russolo suggests that all these sound sources should be incorporated into the creation of a new form of music… Russolo does not suggest a new form of art that is based upon sound: what he proposes is simply as an extension of existing practices in music.” (Gibbs 2007, p.23), he quotes. It is also important to gain perspective from other practicing artists who consider themselves sonic artists and practices of other arts. Vicki Bennett shares a description of her work and how it is perceived depending on context, “It would of course depend who I am describing it to, since I’d be explaining it in a way that was comprehensible and relevant to that person…” (Gibbs, 2007, p.42), continuing when asked about how her work fits into any established class, “ I have called my work sound art, sonic art, collage art, plunderphonia, digital art, avant-garde music, contemporary music….I always recontextualise by means of caollage.”(Gibbs 2007, p.42). Her particular use of the phrase collage is important because it describes this blend of practices. The Path uses a couple of different development platforms and engines compared to others, one of which is integral to the gameplay called “Drama Princess”, which allows a unique function to manifest itself. The technical analysis of these and observations from Karen Collins reveal interesting ties between actions and sounds. Tale of Tales have a research and development project called “Drama Princess” which creates an interesting and unpredictable outcome. It is what they use to make their “virtual actors” which “allows them to behave autonomously, observe and interpret their environment and choose interactions with it.” (The Path PDF Manual 2009, p.6). This function actually allows the player to let go of the controls which leads to your protagonist acting on their own accord, sometimes finding their way to objects, allowing you just to watch. This is an integral element to the path, in that the relationship that a player has with the video game changes and turns them into an audience. “Drama Princess” was made to avoid complex A.I. systems that may have too many “bugs”, Tale of Tales commenting, “We want to use this inclination in order to avoid building complex systems that will always only half-work anyway. Richness in behaviour will add more to credibility than consistency in logic.” (Tale of Tales 2006, para 3). This autonomous function completely transforms the video game into something to be analysed in a different way. Where soundscapes are considered to be part of the realm of sonic art, The Path becomes one. The entire world is now an environment of mixed music and sounds that are all significant to the experience of the game, the computer is an instrument again in this context, the analyst becomes “Faced with all the new possibilities for structuring sound and sequences of sound-events thrown up by digital synthesis, analysis and control, what might be the effect of ordering sounds in one way rather than another, and what might be fruitful avenues for exploration?”(Wishart 1996, p.3). The design considerations for The Path include an interesting array of in game phenomena and sonic actions. Their nature divides them into the already mentioned contextual, technical and aesthetic analyses, but heir effect on the player is interesting and the purposeful implementations create for a unique experience. Though the music is lesser to the sound design, it’s not without its place. As soon as you set foot on the path it begins and it is a motif that is repeated throughout. It is rather discordant and also has some unusual orchestration. On the actual path, it is inclined to sound resolved and harmonic, with a harpsichord and humming, but as soon as the player steps into the forest it is repeated in a different orchestration with the cello. The minimalist and melancholy interpretation and general mode of exploration in the forest is effected by this, and the phenomenon of running becomes affected too. Running is something that is in all games, but the method of exploration in The Path is frowned upon by the game itself. Running influences a particular event based and player triggered sound suite, mainly the introduction of a heart beat and rusty swings in the wind. Collins describes, “ A crucial role of music and sound effects in games is the prepatory function that the audio serves, for instance, to alert the player to an upcoming event…”(Collins 2008, p.129), which is something that The Path has taken a different approach too. As you begin to run, the music fades out, and a single strike of the cello is repeated at random intervals, the screen grows darker and the camera zooms out. As well as the introduction of afore mentioned sound effects, what this design consideration does is force the hand of the player. It is an uncomfortable experience and the only way to end it is to stop, making the player slow down and really experience their surroundings. There is also the in game character, the “Girl in White”. This character runs through the forest and has independent actions. One of her roles is to guide your protagonist back to the main path when you enter the “helpless stance”. The helpless stance is another display of the unique “Drama Princess” virtual actor, which removes control form the player making them an audience again. During this display, a nursery rhyme comes in and some acousmatic sound design too. This sound design’s use in video games is different to other circumstances in that, “Acousmatic sound…is far more pronounced in games, as sound gives the player cues to head in a particular direction or to run the other way…” (Collins2008, p.130). Which helps the player when stuck. Though the design considerations of the game fall into other segments of the analysis, but the phenomenon of running and the action reaction models are interesting structures on their own and observation of them and the autonomy of the helpless stance show san incredible depth, tact of design and imagination that could be studied independently. Sonic art and the differentiation of it from music are arguably separated by the argument of context. In The Path, one needs to analyse and decide what context and how the music is being used. Is it just a backing track? Is there a rhythm to your gameplay, such that your actions and the sound effects of your footsteps or the bang of your gun have these free rhythm to them? However, using the postmodern framework to analyse this aspect of video games, you’re given a couple of different perspective that can lead to significant observations. Using re-contextualisation, you can remove the stigma of soundtrack and commentary from reviews describing the work as having “a fitting suite” or “great tracks”. It allows you to remove it from its source and be analysed separately. Now one can observe the “music” and sound design as sonic elements. Sonic art and the importance of sound design (though important in video games) become monumentally more obvious. The work can be viewed as an independent engine or machine, to be analysed and diagnosed, and finally define itself using the inter-disciplinary status given to video games by sonic art. Collins, K. 2013, Playing With Sound: A Theory of Interacting with Sound and Music in Video Games, MIT Press, Massachusetts. Collins, K. 2008, Game Sound: An Introduction to the Histoet, Theory, and Practice of Video Game Music and Sound Design, MIT Press, Massachusetts.